Aluminum anodizing is an electrochemical process in which an oxide (anodic) layer is chemically built on the surface of the metal. This oxide layer acts as an insulator and can be dyed in a wide variety of colors. Anodizing provides surface corrosion protection along with an excellent substrate for decorative finishes. Anodize is typically specified by the military standard MIL-A-8625F. The MIL-A-8625F spec. characterizes anodize by Type and Class. Type II refers to regular anodize while type III refers to hardcoat anodize. Class 1 is non-dyed or “clear” while class 2 is dyed either black or other colors. 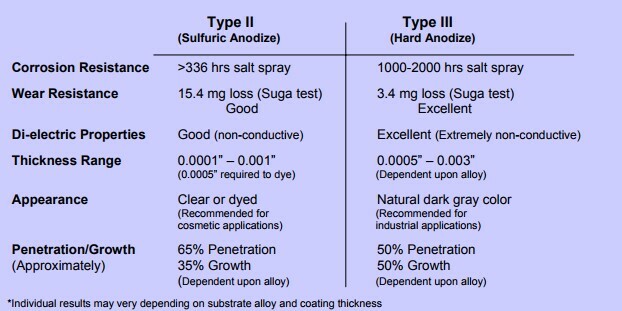 Below is a comparison of some of the primary characteristics of the 2 anodize types. Regular Type II anodize should not require masking since the part is etched first removing .0004 material and the anodize buildup is minimal, usually .0007 with half impregnated into the alloy the other half as surface buildup. As a result, total buildup is .0001 to .0002 per surface face. Hardcoat is a highly abrasion resistant, non-conductive aluminum oxide (Al2O3-xH2O) coating that makes an aluminum surface harder than tool steel due to greater thickness and weight than conventional anodic coatings. Anodic coatings form an excellent base for dry film lubricants, Teflon, paint, and adhesives. Note: You cannot hardcoat over hardcoat, anodize over anodize, build up hardcoat over anodize, chromic over hardcoat, or just add another 0.0005″ to the surface. When two or more parts are welded together, acid is entrapped in the weld and the area around the weld. Color variations exist when a welding rod alloy is vastly different from the alloy used to make the part. Halos appear around welds because of the high temperature used in the welding process. The area around the weldment will be slightly lighter in color, causing the welded area to appear larger than it is. Hardcoat thickness is typically 0.002″ (0.0508 mm). 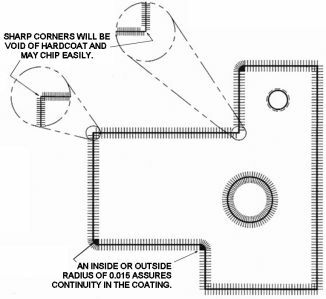 Half the coating thickness is build-up and half is penetration into the base metal. 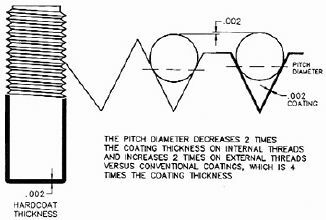 For the threaded rod on the right, the diameter increased by 0.002″ since half of the coating thickness (0.001″) built up the diameter on each side of the rod. Through holes (TH on drawing at right) will hardcoat evenly up to twice the length of the diameter (X). Blind holes (BH on drawing at right) will only hardcoat to a depth equal to the diameter of the hole (X=Y). See chart at right. Example: Alloy 2024 may have a max. coating thickness of 0.005″ and will be gray in color. ++Note: Coatings over 0.0035″ tend to chip and become milky in color and should only be used in the salvage of parts. Dielectric Hardcoat is non-conductive and will withstand 800 volts per 0.001″ thickness. Machining Hardcoat can be ground, lapped, honed or polished. Dyeing Hardcoat may be dyed most colors but tends to come out dark. Sealing Hardcoat may be Dichromate, Ni-Acetate, hot water, or Teflon sealed. Masking is required where no build up is desired or when a part needs both anodizing & chemical conversion. All threaded holes, 1/4″ or smaller, are typically masked when hardcoating unless otherwise specified. Holes with heli-coils must be masked. Any dissimilar metal (steel, brass, bronze) or any form of plating will burn off in the anodizing tank unless masked.